The Mask Edit Layer is a special layer that makes it easy to edit a mask with any brush, tool or filter. While masks do have a number of special brushes that will continue to be useful outside of the Mask Edit Layer this opens up the possibilities even more. Click here to go into the Mask Edit layer. 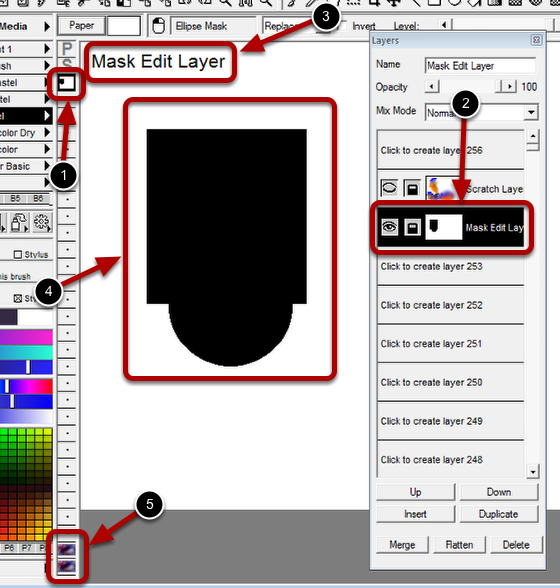 Notice that in the Layer panel there is no entry for the Mask Edit Layer. In this example there is a mask already created. Using the Mask Edit Layer will work either starting with a mask or no mask. After the Mask Edit Layer has been selected this is what changed. Notice there is now a thumbnail in the Mask Edit Layer position in the Layer Mini bar. The Mask Edit Layer position in the Layer panel also now shows the mask data. This label is shown as a reminder that the Mask Edit Layer is active. 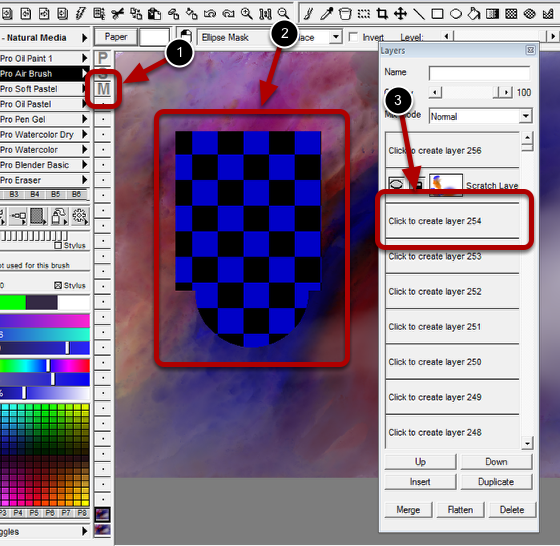 The current mask is shown on the canvas as a grayscale image where the dark areas are masked areas and the light areas are not masked..
Notice the image data is hidden while working on the Mask Edit Layer. 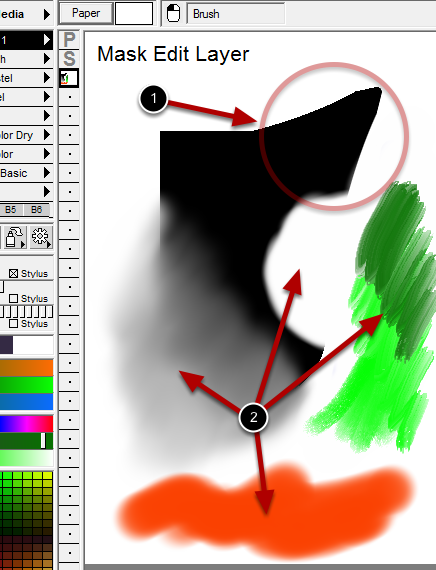 When editing the Mask Edit Layer any brush can be used as well as the tools and filters. Color paint can be used since it's the luminance values that are used to determine the mask strength. However, it is good practice to use grayscale color choices. Colored painted was show here for example purposes. The Warp tool was used to stretch a part of the mask. Various brushes where used for editing the mask. Including, a blender, eraser, gel pen and paint brushes. 1. 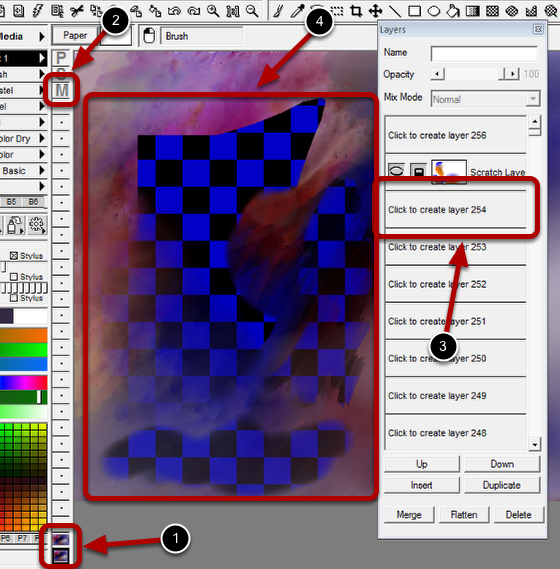 Clicking on your working layer will exit the Mask Edit Layer. 2. Notice the Mask Edit Layer is now missing from the Layer Mini Bar. 3. Also notice that the Mask Edit Layer is gone from the mask layer slot altogether. That is because the data is translated into the real mask after the editing is complete. 4. The edits are translated into a mask automatically.